Walking through the sun-lit streets of New Orleans, there’s a feeling in the air that you just can’t put your finger on. Whether window shopping along Magazine Street, strolling through the Garden District, carefully making your way along the cobbled streets of the French Quarter, or riding an historic streetcar from one end of town to the other, the feeling follows you. As the sun sets over the meandering Mississippi River, that sense becomes stronger. What started as a hint becomes a full-blown feeling as the moon rises overhead – you can almost touch it. Almost. 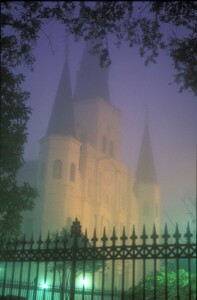 It’s then that you start to understand why New Orleans is known as America’s Most Haunted City. Bourbon Street isn’t the only place where spirits freely flow in New Orleans. Unlike those that are poured and enjoyed in bars and pubs throughout the city, these spirits move quietly through the crowded streets, unseen and essentially unknown. Founded in 1718 and still thriving today, the Crescent City has always had a vivid culture and dark history – this combination makes New Orleans rich with supernatural activity. According to those in the know, ghosts and spirits tend to remain in the buildings that are familiar to them. With nearly 40,000 buildings listed on the registry of historic landmarks, there are plenty of prime places for spirits to haunt. Besides it being her hometown, it’s no wonder that writer Ann Rice chose New Orleans as the setting for her famed vampire novels. “New Orleans is one of the oldest cities in the country,” said Sidney Smith, owner of Haunted History Tours. “We have a rich history of death – and unnatural death. “From plagues to murders and suicides, death has been a constant companion of New Orleans.’ Even our cemeteries are called ‘Cities of the Dead.’ The fascination lives in the fact that everyone loves a ghost story,” Smith continued. When my friend Traci and I were planning a trip to New Orleans several years ago, we talked about all of the things we wanted to do during our stay. Big fans of Anne Rice’s work and the movie “Interview With the Vampire,” we knew for certain that we had to take a vampire tour. On a sweltering Friday night at 8:30 p.m., just as darkness fell, we joined a group of 20 other curious souls in the shadows of St. Louis Cathedral. It was there that we met our guide dressed in a flowing black dress with dark, long hair and an air of mystery about her. Kalila welcomed us and started the tour dispelling any myths we may have heard concerning vampires. I won’t divulge all of her knowledge here, but just know that vampires do not turn into bats, and that their victims do not turn into vampires unless they have been feasted upon at least seven times – and survive. We spent the next two hours making our way through the dark streets of the French Quarter, listening to Kalila recount the tales of vampire sightings, activities and mysteries that thrive in the city. Our group listened to a number of haunting tales, but it was the story of the Carter brothers that stayed with me. These two brothers began stalking residents of the city in the early 1930s, taking people hostage in their home and draining the blood from their bodies. In 1936, the brothers were captured, tried and executed. However, since then, more than 20 sightings of two men who fit the identical description of the Carter brothers have been reported to local authorities. Of the Carter brothers’ four survivors, one went on to feast on blood himself. He disappeared from New Orleans in 1949, but his diary was found in his Bourbon Street home during renovations. The diary went into intricate detail about his bizarre, blood-soaked dreams. His killing and draining the blood of 33 victims may have been the root of those dreams. Another anecdote that Kalila shared with us was very intriguing. When supposed vampires were executed, the carriages that carried them to the local cemeteries would zigzag their way through the city, taking a circuitous route. By doing so, it was believed that the vampires would become confused and wouldn’t be able to find their ways back to their homes. After all, vampires prefer the blood of their families to that of strangers. Toward the end of the tour, our group was standing outside a convent where vampires have been said to rest. As we listened to Kalila explain the vampire culture that took over New Orleans in the 1980s and 90s, and how it continues today, the sky opened up and rain started to fall – the fitting end to a hauntingly good vampire tour. “People are drawn to the mysticism influenced largely by voodoo, which focuses on awareness of the spirit world,” Kalila replied when asked her why she thinks there is such a large interest in ghost and vampire tours. Afterwards, Traci and I got some spirits of our own – namely hurricanes at Pat O’Brien’s – and walked through the haunted streets. Among the buildings we passed was one we’d passed on the tour, Lafitte’s Blacksmith Shop. The oldest working bar in the United States and the second oldest building in New Orleans, there are sure to be spirits – both alcoholic and otherworldly – residing there. 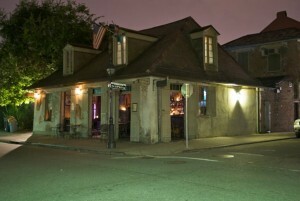 Lafitte’s candlelit tables and dark atmosphere make it an ideal vampire tavern. And its on Fodor’s 10 Most Haunted Bars in America list. New Orleans is certainly a city for everyone. World-class dining, boutique and antique shopping that rivals any European city, nightly street parties that thrive until dawn, inspiring architecture and people-watching beyond compare. But just remember. While you’re enjoying yourself in the Crescent City, perhaps sipping café au lait and nibbling beignets at Café du Monde, someone may be watching you.